You can’t be careless to your body when you are pregnant. Whatever you do can affect the baby inside you. It applies even when you have to deal with pregnancy acne. Not all acne medications have been studied of its effects towards the baby inside a womb. However, many doctors would not recommend the drug type for sure. Even the topical ones are not always safe. So, let’s opt for drug-free treatments just to be safe here. As you might have known, face skin needs to be clean from dirt, sweat, and oil if we want it to not cause any acne on. However, when you are in your pregnancy, there is proper washing needs to be done. First of all, it is important for you to know that washing during pregnancy must be limited to 2 times per day and after heavy sweating. To do the washing though, you need to use cleanser that is gentle, oil-free, alcohol-free, and nonabrasive as well. Such cleanser has lower risk of affecting your baby inside. After you are done, use lukewarm water to rinse it instead of the cold one. To dry your face skin, you can just pat your skin dry and apply moisturizer after that. If you use washcloth instead, be sure it is changed every time you do so. Also, remember to not over cleansing your face. Doing so will only over-stimulate the oil glands of your face skin and eventually cause acne during pregnancy. Did you know? Oily hairs are also one of those reasons that cause acne on your face to begin with. Since you are carrying a baby inside your body, you might sweat more and produce more oil than you did before. That is why we need to have this issue under control. One way you can do for it would be to shampoo your hair. However, don’t just do it every once in a while. In order to prevent pregnancy acne, you need to wash your hair regularly. Really, don’t just wait until you don’t feel comfortable with it. If you have oily skin in the first place, then you have to shampoo every day. It is not overdoing it at all. We do need even such hair treatment to prevent your skin from producing excess oil that can cause acne on your face. As part of the pregnancy acne methods, it is suggested to you to avoid oily hair mousse or pomade near the hairline. This will do the job to deal with acne on face. Doing those two methods above would take care of that acne on your face. However, it would be good if you can prevent the bacteria from getting into contact with your face to begin with too. You know that bacteria make those acnes popping up from your face skin. As one of the pregnancy acne treatments, we suggest you to keep your hands off your face. So, don’t touch your face so frequently. You touch things with your hands after all. So, the bacteria can transfer from your fingers to your face if you touch it. Other things can build up bacteria too. One of them would be the surface of your hand phone. You touch it almost all the time and you have to hold it against your face to pick up the call. So, use earphones instead to prevent the bacteria from transferring to your face. Pillowcases are practically the same. So, consider changing your pillowcases frequently to do the job here. If you are pregnant you should know about Pregnancy Massage Which Every Mother Needs To Know. There you go. Those are the 3 methods you can do to deal with pregnancy acne safely. There is no drug needed here, so you don’t have to worry about the well-being of your baby. Also, since they mostly involve fixing your daily habits, those methods sure are cost effective. You don’t have to worry about spending extra money just to treat your acne. You only have your baby to worry about. 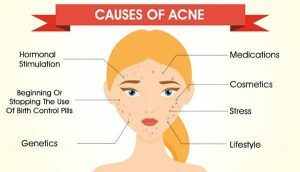 So I would suggest that you read our detailed article about Acne problems diagnose and treatment we Briefly Described Acne Symptoms And Treatment.